Joel was kind enough to make Justin one of his projects for the clinic. He rode him every day and helped us understand a bit more of what Justin needs to work out his braces. I had the chance to work with him the days following the clinic and all I can say is WOW he feels like a different horse! With Joel’s help Justin is well on his way to meeting potential adopters and showing them his sweet and gentle personality. 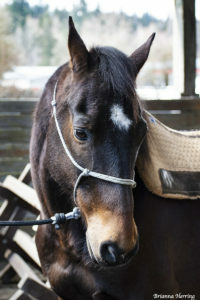 I have been riding him since he came back from training and he has steadily been getting better. At first there was no bend or flexion, especially to the right. He felt like a stiff motorcycle trying to circle at the trot and lope to the right. Joel explained that to help Justin soften out of this brace, we need to help him shape up around the inside and engage his inside hind under himself in transitions. 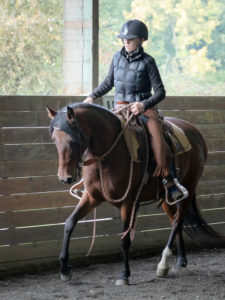 We need to do this repeatedly to help him strengthen and power in balanced, soft gaits. 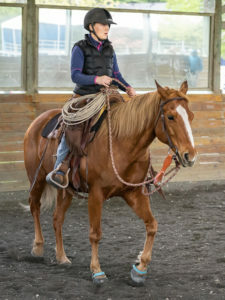 As with a green horse, we need to be cautious to not use two reins too quickly, but it is also time for him to start to feel both reins when we ask for a soft feel and releasing quickly when he gives. 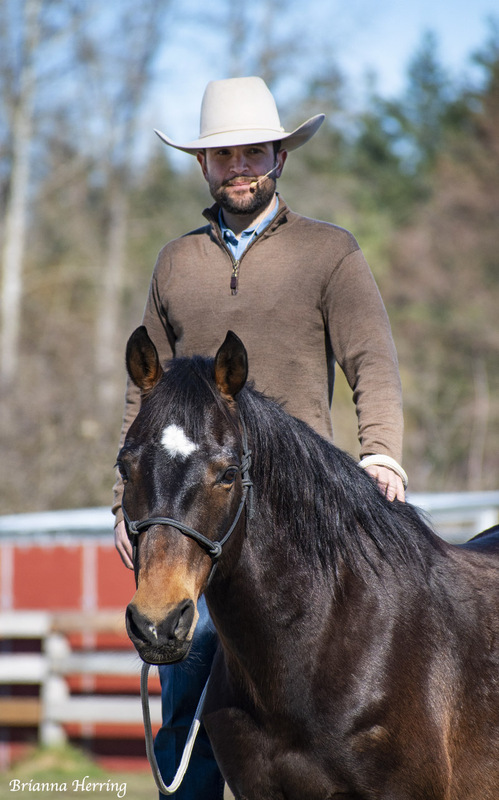 Justin did great during the groundwork segment of the clinic and was super calm and relaxed. 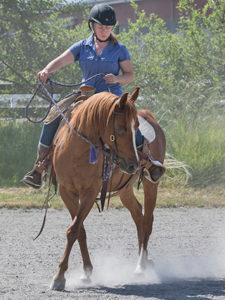 We worked on the hind quarter and front quarter yielding. Because of how forward Justin is, I focused on getting him back more as I asked him to yield his front quarters and that seemed to help him pivot and cross over. Justin and I are both learning on that move. Joel and I also worked together on getting Justin to bend a bit more when he yielded his hind quarter. That helped. At times Justin “leaves” me when he is on a unified circle getting to straight with his neck. So, I worked on bending him a lot. By Sunday I felt like Justin was much better bending during a unified circle. We still have a lot of work to do but he got a lot better. Justin is very responsive and always looking to do the right thing when asked. The thing I like so much about Justin is how kind and willing he is. Never seems to have a reaction out of anger. He never gets mad at me. Never gets “pissy.” At times he may brace a bit, but he always goes. He always responds. He backs up nicely from a distance and when I am under his chin. I’ll be working on getting him to back up with a bit more effort as he mostly drags his feet when he backs up. I’m really looking forward to riding him and earning his trust. During groundwork one of the things I focus on is rubbing his forehead when he does what I ask correctly. As a result, I notice he is starting to come into me a bit, lower his head and release as I give him a forehead and neck rub. He seems to really like it. I find it helps him to relax. We are having a great time working together. 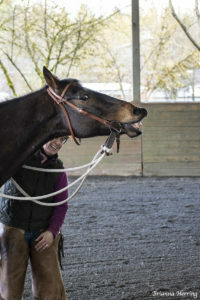 Every time I finished riding Justin makes this face!